Drystone dykes are a major landscape feature of Applecross. Primarily of importance for stockholding, stone dykes were the dominant field boundaries where rocky outcrops, climate and thin soils make the use of hedgerows impractical. Today in Applecross these dykes are still used as field boundaries, but they also play an important role in wildlife conservation, particularly as homes for small mammals and invertebrates. However, as with many of Scotland’s dykes, they were in a poor state of repair, damaged by natural action from trees, livestock and storms, and by modern roadways. This project aimed to restore this section of dyke running the along Smiddy Wood from the entrance to Applecross (cattle grid) to the shop (1150m of dyke in total). The dyke bounds the single track roadway to the Bay and forms part of the unique character of the area. Geoff Walker and Darren Jones undertook the work, using new stone where necessary. 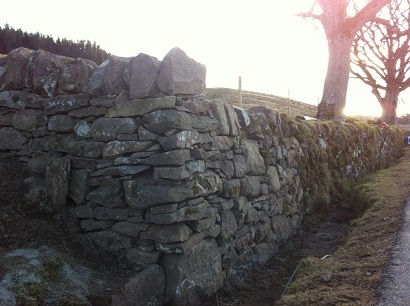 The result is spectacular; the dykes are a part of Applecross history but also of its future. The repair of the Smiddy dykes was part of a wider scheme of landscape improvements in the Smiddy Wood area, which included the removal of stumps and brash from the felled plantation woodland, planting of native tress and seeding of traditional parkland.